I do not have a large typewriter collection, and many typewriters in my collection are quite ordinary, but I have lately acquired a 1908 Royal Standard No. 1, which is in fairly nice condition. 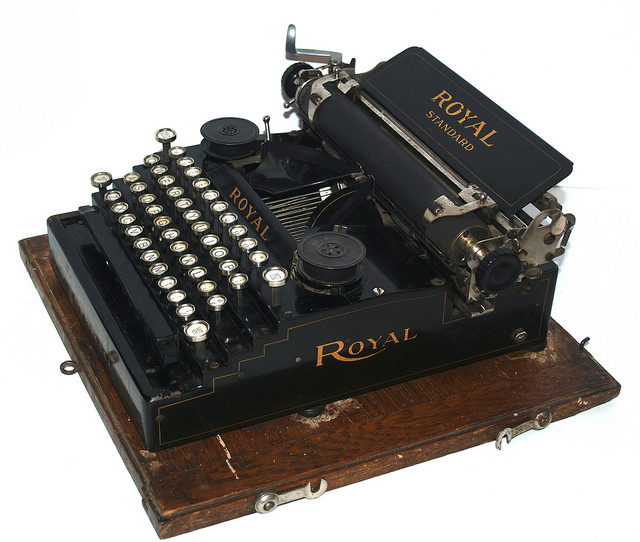 Royal entered the typewriter market in 1906, and subsequently went on to become a leader in the industry; however, the Standard, somewhat awkwardly shaped (I think it looks like a cash register or adding machine), was not an overwhelming success. I will be posting more photos and comments later, but you can read about the Standard at Machines of Loving Grace (here). Note: I also own a Standard No. 5, but it is in very poor condition.